The myth of Odysseus adapted by Lanarkshire author Des Dillon. Narrated in the short film Standing Start by Iain Agnew. Man: a being in search of meaning. Even in the calamity of a demented battle ground, we are vessels. A surface of senses. Beneath, there’s skin and bone and the engines that thrum blood. Coded by gods, exploded. That man is wisest who, like Odysseus, realises that his wisdom is worthless; but the measure of a man is what he does with power. Life is an unfoldment. To understand the things that are at our door is the best preparation for those that lie beyond. And there, Odysseus sat at ease, day in, day out, till a year had run its course. But then when the year was through, his loyal comrade took him aside and whispered to him ‘Odysseus, Odysseus, this is madness! High time you thought of your own home at last!’ He loosed the slack and all the winds burst out and a sudden squall struck up and swept him back to sea, wailing in tears, far, far from his native land. Know yourself, Odysseus, know yourself! For a man to conquer himself is the first and noblest of all victories. 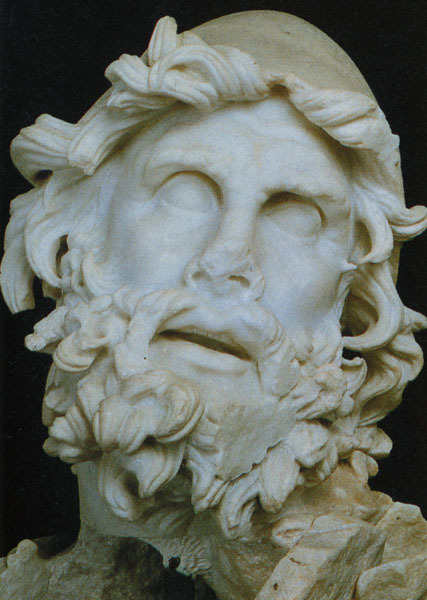 Odysseus binds to himself again the power of heaven, the light of the sun, the brightness of the moon, the splendor of fire, the flashing of lightning, the swiftness of wind, the depths of sea, the stability of earth, the compactness of rocks. Because beyond the horizon there may be defeat, some men stay. If this tattered ship were heaven bound, they’d go. If god lay beyond these waves, they’d go; and some men who have nothing, they would go. I’m tired, I’m tired, I’m tired. I’ll go. Odysseus, he knows defeat, and so will strive with all his might and he will go, he will go, he will go. He will fly away from Ithaca to Illyium as quickly as he can and to fly away is to become like god, and to become like god is to become holy, just and wise. A hero is born among a hundred, a wise man is found among a thousand, but an accomplished one might not be found even among a million men. And now to the battle. And if Odysseus should die, let it be like this: remembering those he has loved and those who have loved him; forgiving his enemies, and them him; and grateful for having shared the earth with the butterfly and the wolf. And should he live? The same my friend, the same.